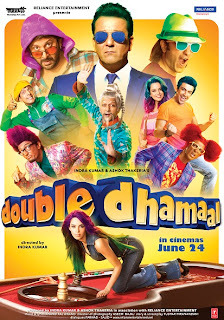 The promotions for Double Dhamaal have been really high on quantity but the same cannot be same about the quality. Dhamaal was a success at Box Office and was liked by the audience as well. Though the humour was slapstick even in Dhamaal, it never seemed to try too hard. However from the promos of Double Dhamaal it seems that the sequel is just to cash in the popularity of the original as the humour seems forced and crass. However being the sequel of a popular film and a comedy along with heavy promotions, it seems that the film will get a decent opening. It may turn out to be a success(more in smaller cities/towns than metros) but it seems difficult that it will be as liked by the audience as Dhamaal. Double Dhamaal got a really good opening with better numbers than were predicted by most trade analysts. The audience reaction has however not been that good. Some have found it to be a decent comedy, some feel that its a time pass type but not nowhere as funny as Dhamaal. While there are a lot of people who just hated it and found it a waste of money, there have been reports of people walking out of the theatre within the first 30 minutes. However being a solo release this weekend it may put up decent numbers this week for the lack of choice among the audience but since the next Friday will see the release of much awaited Aamir Khan produced Delhi Belly and Amitabh Bachchan starrer Bbuddah hoga tera baap, it doesn't seem Double Dhamaal has any chance after the first week. Aside from a few laughs post-intermission, this film is a crashing bore. On the whole, DOUBLE DHAMAAL is a seriously hilarious movie that lives up to its title -- it's double dhamaal all the way. With a negligible funny quotient and a feeble script, DOUBLE DHAMAAL ends up being a 'double' disappointment. Double Dhamaal is a huge disappointment. Especially for those who've seen the first part. And even for those who haven't. Watch it at your own risk. So is Double Dhamaal a total wash-out? Well, no. As I said, it’s sporadically funny... a comedy of this variety needs to deliver non-stop nonsense instead of episodes of stormy laughter punctuated by long long lulls. This one's definitely not for the fastidious, choosy viewer but for those who don't mind losing it for a bit, Double Dhamaal works like an average Bollywood comedy.